Family was also a concern in Wilson's second novel, Perfect Little World, about a Gilligan's Island-type collection of adults and children who participate in an experiment about child rearing. What I love most about Wilson's writing is that he'll start off with these goofy, almost sitcom-type contrived premises and from there create stories that knock you out with the force of their emotional truth. That distinctive sweet-tart flavor of Wilson's writing is triple-concentrated in his new short story collection, Baby, You're Gonna Be Mine. It was almost midnight when my girlfriend got a call from her sister, who had been arrested for taking a kebab skewer at a cookout and stabbing her husband. Even though it was over an hour away, I drove my girlfriend to their house so she could watch her nieces and nephews until their parents found a way to get back home. "If they end up killing each other," my girlfriend told me, "I think I'm the one who gets custody of the kids." I didn't have to say anything in response because she knew as well as I did that I would not be around if that scenario ever became a reality. Whoa. Just as we're taking in that mess of information about the quality of the relationships here, we meet those aforementioned kids, whom the narrator describes as "as close to feral as you can get, like animals dressed up in camouflage jumpsuits." The most disciplined is the oldest girl, who's around 14. She's obsessed with a video game about the apocalypse, where she has to try to kill zombies with weapons like "a baseball bat with nails in it." My girlfriend and I sat on the floor and watched the oldest do her thing with the video game, finding no weapon to her liking, eventually giving in to her inevitable and quick death. She wanted, I now understood, to be stronger than anything evil. But she never would. In ingenious ways, all the stories here are about surrender, whether they're about a character's surrendering to loss or human failing. For instance, there's a quiet stunner of a story called "A Signal to the Faithful," about a sensitive, fatherless boy named Edwin and the troubled priest who befriends him. Contrary to expectation, nothing sexual happens; but, a game of make-believe the two play together is devastating in the way it exposes the pain that lives within the emotionally stunted priest. Other stories, like "Housewarming" and the title story feature parents who've surrendered to the knowledge that their angry adult children are beyond saving. In that title story, a mom gets a phone call from her son, a once moderately successful rock musician whose band, Dead Finches, has just broken up. Much to her dread, the son moves back home. A narcissist, the son thinks the end of his musical career is a unique blow, but his widowed mom knows otherwise: "She understood exactly what was happening, that he had devoted his life to something that had ended before he was ready. ... She knew what it felt like." All the while I was reading Baby, You're Gonna Be Mine, I kept hearing one of Holden Caulfield's signature lines in my head. Remember how Holden is always saying variations of, "That killed me" about people or books that deeply affect him? There's a lot of Salinger in Wilson's writing — the wit, the vulnerability and the cosmic sadness. And, these new stories of Wilson's are something else; they're funny, raw and beautiful and, for sure, they killed me. This is FRESH AIR. Kevin Wilson is known for his best-selling novels "Perfect Little World" and "The Family Fang," which was made into a film with Jason Bateman and Nicole Kidman. But Wilson started out as a short story writer. His 2009 collection "Tunneling To The Center Of The Earth" received an Alex award, from the American Library Association, and the Shirley Jackson award. His new book, a second short story collection, is called "Baby, You're Gonna Be Mine." And our book critic Maureen Corrigan has a review. 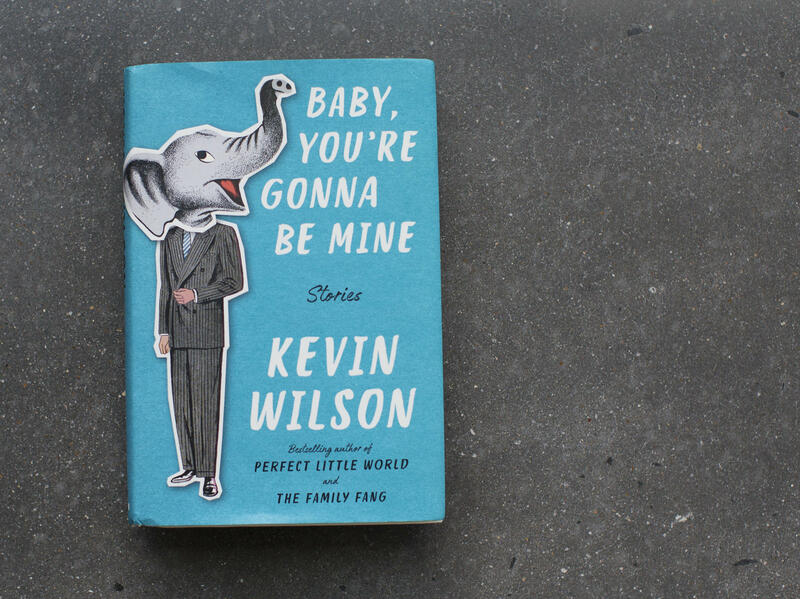 MAUREEN CORRIGAN, BYLINE: I've been a fan of Kevin Wilson's writing since 2011, when I read his debut novel "The Family Fang." That novel delved into the life of a husband and wife pair of performance artists, who work their young children into their pieces. Without being pat about it, Wilson drove home the realization that every family constitutes its own ragtag troupe of performance artists and that children are mostly at the mercy of their parents' acts. Family was also a concern in Wilson's second novel "Perfect Little World" about a "Gilligan's Island"-type collection of adults and children who participate in an experiment about child rearing. What I love most about Wilson's writing is that he'll start off with these goofy, almost sitcom-type contrived premises and from there create stories that knock you out with the force of their emotional truth. That distinctive sweet-tart flavor of Wilson's writing is triple-concentrated in his new short story collection "Baby, You're Gonna Be Mine." Take the opening lines of the very first story called "Scroll Through The Weapons." A young man named Cam is narrating. (Reading) It was almost midnight when my girlfriend got a call from her sister who had been arrested for taking a kebab skewer at a cookout and stabbing her husband. Even though it was over an hour away, I drove my girlfriend to their house so she could watch over her nieces and nephews until their parents found a way to get back home. If they end up killing each other, my girlfriend told me, I think I'm the one who gets custody of the kids. I didn't have to say anything in response because she knew as well as I did that I would not be around if that scenario ever became a reality. Whoa. Just as we're taking in that mess of information about the quality of the relationships here, we meet those aforementioned kids who are feral in ways that can't be politely described on radio. The most disciplined is the oldest girl, who's around 14. She's obsessed with a video game about the apocalypse where she has to try to kill zombies with weapons like a baseball bat with nails in it. At first Wilson seems to be riffing on the old decay-of-the-family theme. But his story grows more nuanced so that when Cam again looks at that tough teenager playing her vile video game, his reaction shifts into a commentary on the tragic nature of life. Cam says, my girlfriend and I sat on the floor and watched the oldest do her thing with the video game, finding no weapon to her liking, eventually giving in to her inevitable and quick death. She wanted, I now understood, to be stronger than anything evil, but she never would. In ingenious ways, all the stories here are about surrender, whether they're about a character's surrendering to loss or human failing. For instance, there's a quiet stunner of a story called "A Signal To The Faithful" about a sensitive, fatherless boy named Edwin and the troubled priest who befriends him. Contrary to expectation, nothing sexual happens. But a game of make-believe the two play together is devastating in the way it exposes the pain that lives within the emotionally stunted priest. Other stories like "Housewarming" and the title story feature parents who've surrendered to the knowledge that their angry, adult children are beyond saving. In that title story, a mom gets a phone call from her son, a once moderately successful rock musician whose band, the Dead Finches, has just broken up. Much to her dread, the son moves back home. A narcissist, the son thinks the end of his musical career is a unique blow. But his widowed mom knows otherwise. She understood exactly what was happening, that he had devoted his life to something that had ended before he was ready. She knew what it felt like. All the while I was reading "Baby, You're Gonna Be Mine," I kept hearing one of Holden Caulfield's signature lines in my head. Remember how Holden is always saying variations of that killed me about people or books that deeply affect him? There's a lot of Salinger in Wilson's writing - the wit, the vulnerability and the cosmic sadness. And these new stories of Wilson's are something else. They're funny, raw and beautiful. And for sure they killed me. GROSS: Maureen Corrigan teaches literature at Georgetown University. She reviewed Kevin Wilson's new short story collection called "Baby, You're Gonna Be Mine." Tomorrow on FRESH AIR, we'll talk about growing up in the '70s in the Mojave Desert on a secret weapons testing site where her parents designed missiles. My guest will be Karen Piper, author of the new memoir "A Girl's Guide To Missiles." Her home was a place where a bomb could accidentally land on your house, parachuters fell from the sky and a man could fly by in an ejection seat. I hope you'll join us. I'm Terry Gross. (SOUNDBITE OF DEVO SONG, "GUT FEELING") Transcript provided by NPR, Copyright NPR.